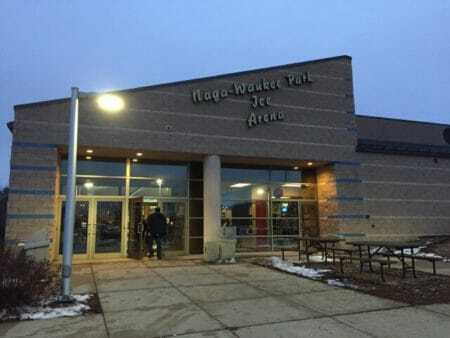 The last park on our list was Naga-Waukee Park Ice Arena at 2699 Golf Road, Delafield, WI 53018. This is a different park and location than Naga-Waukee Park, which our family visited in August. The parking lot is very large, though the west side is part of the Wisconsin Department of Transportation Park & Ride lots. It is a designated stop for shuttles running to Summerfest and the Wisconsin State Fair, which means it can be very busy during those times. Our kids have bank accounts at Waukesha State Bank and are members of Friendly’s Club for Kids, which makes visiting the bank, making deposits, and learning about money fun for newborns – teens (15 years old). 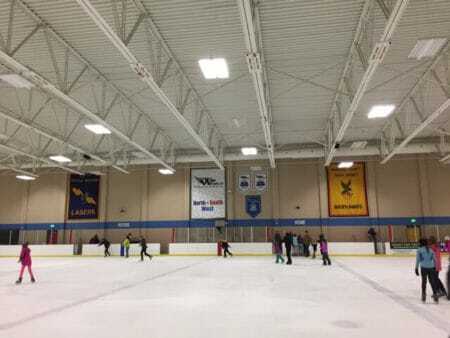 Last month, members received a postcard invitation for afternoon skating at Naga-Waukee Ice Arena on December 16. 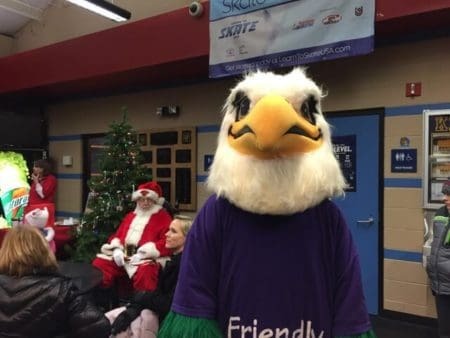 Not only would they receive complimentary admission and skate rental, but Santa and Friendly the Eagle would be there too. Given our 2017 goal to visit all of the parks this year, you bet we RSVP’d yes! Annual park stickers for non-ice arena parks in Waukesha County can be purchased here too. 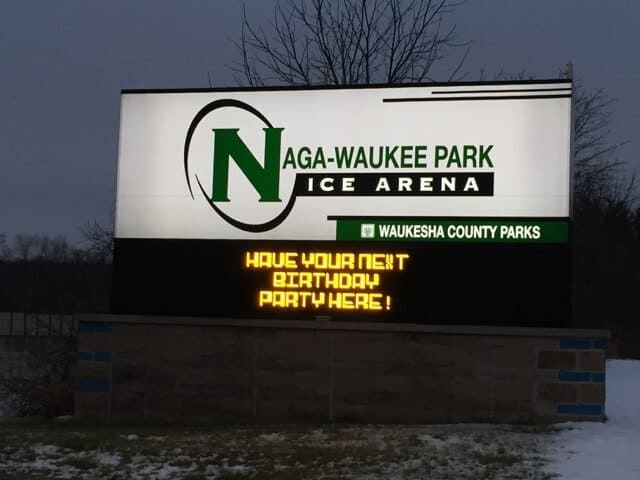 Naga-Waukee Park Ice Arena is home ice for high school hockey teams, adult hockey leagues, and a figure skating club so be sure to check for public skate schedule online or to call their Public Skate Info Line: (262) 646-7071. 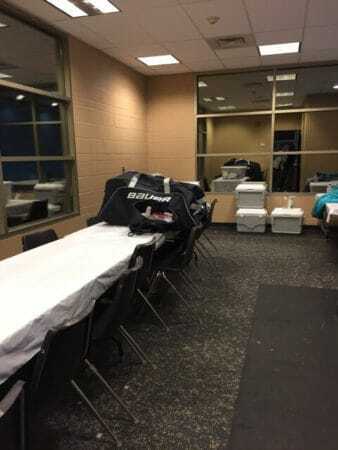 This ice arena has a back room just off the lobby that would be great for parties or other special events. Most of the action today was in the lobby where Santa and Friendly the Eagle were visiting. These ice skate laces made me understand how Rapunzel must feel. These were some seriously long ice skate laces. I ended up tucking my left side’s bunny ears under the laces and wrapping my right side’s bunny ears around my ankle. 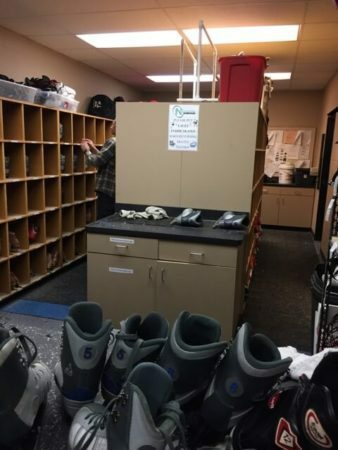 No wonder their skate rental area’s sign asks everyone to tuck in the laces in to the skates when returning them. 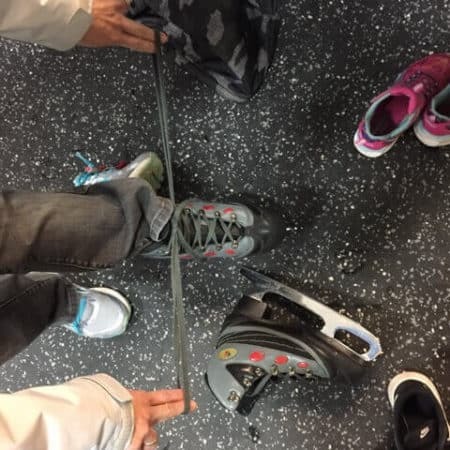 Last weekend we had a quick jaunt to Eble Ice Arena, so our short-term muscle memory kicked in pretty quickly. My husband cheered us on from the bleacher section. 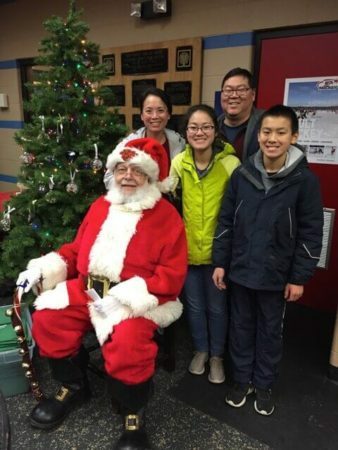 The kids and I glided with more confidence on the ice than just one week ago. The rink was filled with families, a Hans Brinker in the making, and teens encouraging one another along the wall. We popped into the player’s box to make sense of a coach’s plans. 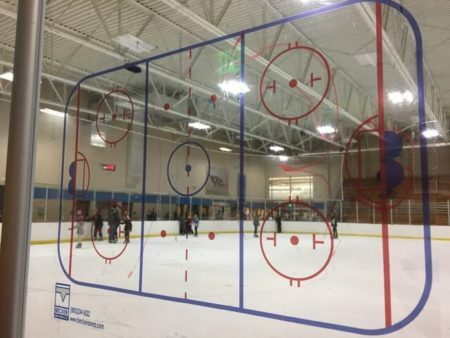 We imagine this gets a lot of use with all of the hockey teams that play here. We left the ice at 4:59PM just one minute before public skating official ended at 5:00PM. We didn’t see the Zamboni getting ready, and I had been watching the garage door in anticipation. I don’t know if the Zamboni was going to resurface the ice before the hockey players took the ice, but we didn’t have time to find out. We tucked our super long laces into our ice skates before returning them to the window and zipped out to the lobby in order to catch Santa. We didn’t know how much longer he would be staying, given his busy schedule this time of year. 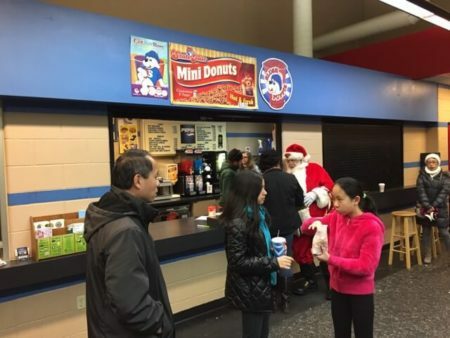 After visiting with us, Santa made his way to the snack bar. He might have been asking if any hot mini donuts were available or he might have been inquiring about a 2018 Waukesha County Park sticker just requested by the Fujimotos. We visited the Wisconsin Christmas Carnival of Lights in Caledonia. 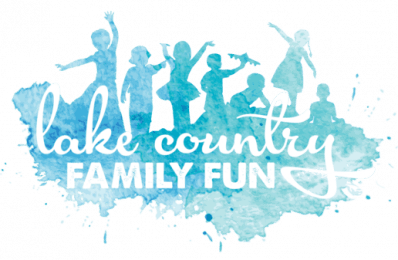 (*Lake Country Family Fun received a complimentary ticket to attend, but all opinions are Jann’s own.) It was maybe a 45 minute drive from our neck of Lake Country. We had hot cocoa and snacks ready for this part of the day’s adventures. If you go, enter so you are driving north on Hwy 38 or you will have to go south and turn around. What a creative winter use for the campgrounds that already have electrical outlets for campers! It took us a little while to realize the lights like the Loch Ness Monster and veterans tribute were coordinated with the music playing on 87.9 FM. We liked how the cabins were decorated and the different displays throughout the mile long drive. 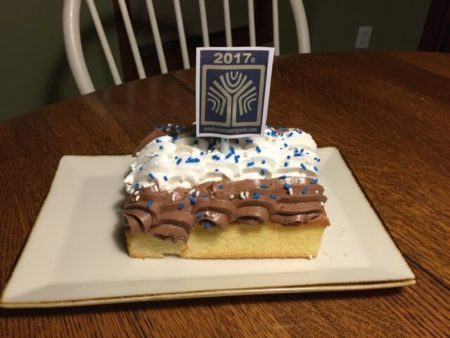 We ended our evening and year’s worth of park visits with a smorgasboard at home. Bread, butter, cheeses, smoked salmon, salad, rye crisps and other yummies filled our tummies as we reflected upon all of our adventures this past year. Each night at dinner, we go around the table to discuss the best part of our day. Our answers were all park related – either ice skating or visiting all of the parks today. When we talked through our 2017 park adventures, Fox Brook, Nashotah, Ebel Ice Arena, Naga-Waukee Ice Arena Park , and Mukwonago Park were all places some or all of us would like to see more of. We talked about frisbee playing, picnic lunches, geocaching, exploring new places, ice skating, hiking, and losing my sunglasses (last seen at archery tower in Menomonee Park). We laughed about the mosquitoes (easy to do in the winter) and wondered how busy the sledding hills get. We even started discussing plans for 2018 that include camping with friends, looking for more geocaches, and exploring the lakes by water. This, dear readers, is exactly why I’ve wanted to do this for years. No matter what the future holds for our family, we will always have these precious memories of visiting these parks in 2017. Jann Fujimoto and her family accomplished their 2017 goal to visit all 11 Waukesha County Parks in one year! 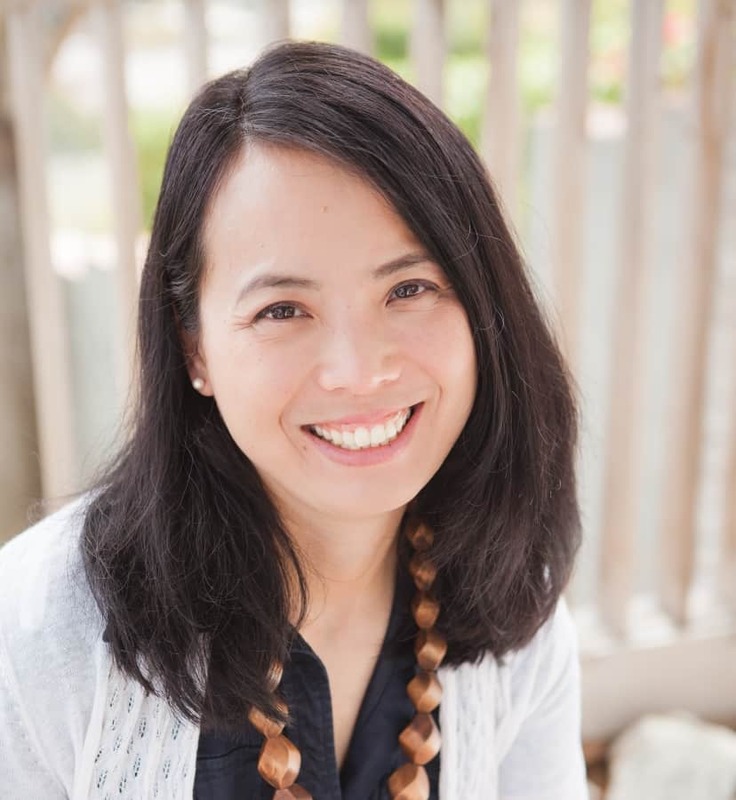 When she’s not at a park with her husband and two children, she’s a speech-language pathologist and avid reader. « Petite Pas Ballet School **Giveaway**	» Kids Dream Film Series is Back!